Workoutlikeamum offers a variety of outdoor classes (Circuits, Hiit, Mum & Baby etc.). Exercise should be fun! Yes, there will be times when it’s hard, and your muscles hurt, but if you’ve enjoyed doing it then you’re so much more likely to stick at it. The classes are planned to keep them fun and different every time to achieve this. The classes are designed to fit around your life as a busy mum so children are welcome at all classes. Sarah who runs the classes is a fully qualified Personal Trainer who also has qualifications in Pre & Post-natal Exercise. Workoutlikeamum is set up to be flexible and work for busy mums but you don’t have to be a mum to come. There are plenty of people who come every week who aren’t. Classes run Monday – Saturday in Clifford near Wetherby, full details of all the classes can be found on the website here. The Wednesday 6.30pm Hiit class and Saturday 9 am outdoor class are now mixed so that Men can join in too! Workoutlikeamum also offers Personal Training sessions which can take place either in the comfort of your own home or at one of the sites used for group classes. It’s a great way to get a more personalised and focused programme for you as an individual. Quote Mumbler when booking and receive a FREE trial class. Baby Bootcamp is a unique and effective Pre and Post Natal exercise class that allows you to exercise, stay strong in preparation for child birth or rehabilitate your body after child birth. Baby Bootcamp allows Post Natal parents to bring their children without the need of childcare. Once you have had your 6 week GP post natal check up then you can come along to join classes in safe hands with pre & post natal specialist personal trainers. Pilates for you and your baby with Miranda Wells. A great way to improve your physical and mental wellbeing in a safe environment with your baby. £6 per session (reduced rate for members) you can book-in on a week by week basis. Chapel Allerton Lawn Tennis & Squash Club, LS7 3QX. Tel:0113 2266622. Outdoor post natal exercise classes and Personal Training. Learning safe and effective exercise techniques for new Mum’s who want to bring baby along too. MONDAY & THURSDAY: Horsforth Hall Park, 10am. A fully equipped Pilates studio with a wide range of classes and one to one sessions. 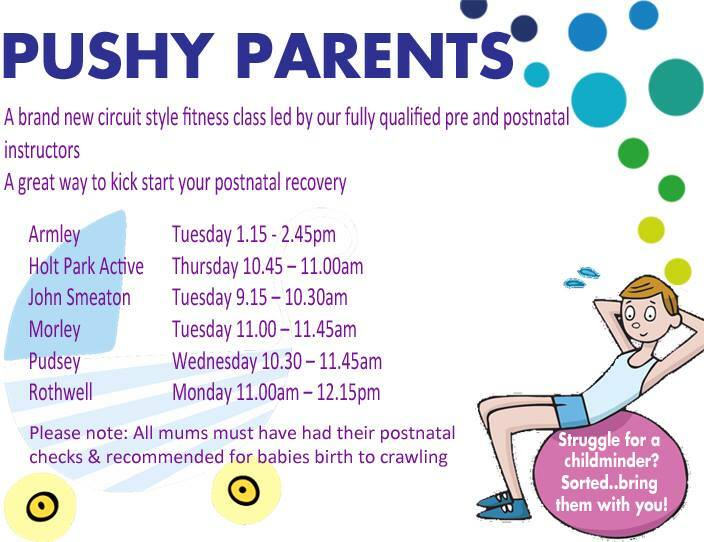 Come and workout in a fun friendly environment with your very own personal trainer… your baby! Adaptable exercises catered to your own specific needs, suitable for all different levels of fitness, looking at strengthening pelvic floor muscles and regaining your pre baby body again. 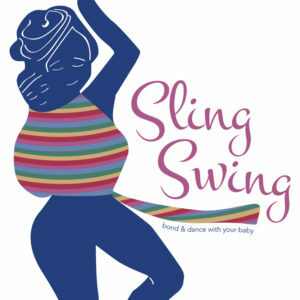 A babywearing fitness and dance class that helps you recover after pregnancy and regain strength in your abs and pelvic floor muscles. Kangatraining is a complete body workout that is also a fun way to get back into shape together with your baby. MummyFIT’s mission is to support you to meet your health and fitness goals either during or after pregnancy whilst having fun and meeting new friends. A program of Fitness and Nutrition group personal training classes designed just for you and your needs and goals. The original 45 minute full body pram exercise class. Pramercise is a circuit style class, differentiated to allow all levels of fitness to join, targeting all the key “mummy” areas. Shadwell Studio is a boutique hot yoga specialist studio, open 7 days a week offering Pilates, Yoga, Barre, Meditation, Mindfulness and so much more! Starting on Wednesday 17th April: Mum and Toddlers Yoga 10:45-11:30. Mum and Baby Yoga 11:45-12:30. Hi My name is Jo, I run a small Pilates/Ballet barre studio in North Leeds specialising in small classes for individual attention. I specialise in Pilates for runners and cyclists and I am an exercise specialist in breast cancer rehabilitation restoring mobility, confidence and strength after surgery. I run specific classes for men and also for mums and babies (Thursday 11.45), it is crucial as a new mum you recruit your core properly to avoid abdominal separation. Trib3, a bootcamp gymnasium concept is offering a class where you can come along and bring your baby (in a car seat/carrier) The music will be slightly quieter than usual for delicate ears, and all exercises will be suitable for post natal and breastfeeding mums. Not just for mums but dads, nannies, grandma etc. Wheelie fit mums and Wheelie fit mums+, the fastest growing postnatal class in Leeds. Mixing fitness with friendship and fun will see the baby weight disappear and confidence rise, what more would you want from a fitness class. All you need is a small mat (for floor exercise), water and ooh yes….. don’t forget your baby.